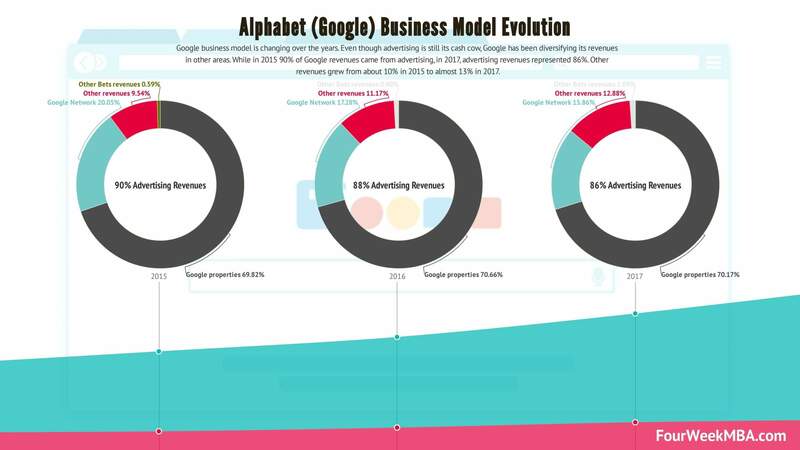 Google business model is changing over the years. Even though advertising is still its cash cow, Google has been diversifying its revenues in other areas. While in 2015 90% of Google revenues came from advertising, in 2017, advertising revenues represented 86%. Other revenues grew from about 10% in 2015 to almost 13% in 2017. Google monetization strategy has been changing over the years. Even though Google still follows an advertising business model at its core. Alphabet (this is how Google got rebranded) has been diversifying its revenues in several areas. It is interesting to observe how Google revenue composition is changing over the years. Advertising revenues changed from 90% in 2015, to 86% in 2017. At its core, Google has been a highly profitable company since its IPO. Indeed, when investors looked under the hood of Google the found a company which was highly profitable, it was growing at lightspeed, and it was meant to dominate the digital space. Over the years Google managed to keep its operating margins pretty high. Indeed Google‘s operating margins or the percentage of revenues that are represented by operating income has gone from 28% in 2013 to 24% in 2017. It is critical to distinguish between the acquisition costs of Google on its search pages and that outside its search pages. Indeed, to get traffic on its search pages, Google has to close deals with partners to guarantee a continuous stream of traffic. Instead, to allow businesses part of the Google AdWords (now Google Ads) platform to be featured within web properties part of Google AdSense, Google shares its revenues with the publishers that allow Google to place banners on their properties. Therefore, Google has way higher costs in a percentage of segment revenues on its members’ properties, than on its properties. Keeping this distinction in mind is critical to have a deep understanding of the Google business model.